The first time I saw Forbidden Planet I came away thinking that Star Trek was an unauthorised television adaptation, and how did they not get sued? I still (somewhat) jokingly refer to it as the first Trek movie. That being said, I picked up a novella on Project Gutenberg a few years ago–and remember neither the author's name nor the title—that was a pulpy scifi space adventure about an interplanetary craft with a Martian crewmember among an otherwise human crew, and that Martian (or were there two?) was just another officer, a natural and respected member of the crew, just like our Vulcan first officer (who was Martian in the earliest drafts). The chief engineer was Scottish. In think it was from the 1930s, and it was so Trek-like, I wondered if it had been another source, but on the other hand, it was so obscure it couldn't possibly be. I'll see if I can find it again. Probably just a bizarre coincidence. A classic SF series with ships with Human and Martian members of the same crew is stories by Eric Frank Russell collected in Men, Martians, and Machines (1955). The stories were published from 1941 to 1955. The Martians resembled giant octopi. Edmund "World Wrecker" Hamilton's Interstellar Patrol series published from 1928 to 1930 featured Humans and strange aliens serving together on the same ships. Fiction is made up of tropes. Lots of works in the same genre use the same tropes. It's not theft or coincidence, it's just using a common language of storytelling, building on the same body of ideas that pervade the whole genre -- like murder mysteries set at wealthy estates, or country songs about your girl/man leaving you. Star Trek built on the pervasive tropes of its genre, just as many other works did. Martians were the go-to aliens in fiction for generations, from The War of the Worlds to "A Martian Odyssey" to The Martian Chronicles to Martian Manhunter to Marvin the Martian to My Favorite Martian and so on. And Scots have had a reputation as great engineers for centuries, so fiction used to default to portraying engineers as Scottish, much as it used to default to portraying police officers as Irish. And Spock wasn't definitively Martian in any draft; rather, the original series pitch document written for the networks said that Spock was "probably half Martian," but didn't pin it down beyond that. It probably just used "Martian" as a placeholder because it would be a familiar trope to network executives and get the idea across to them. The concept's been around in physics since 1916, but it never seemed to get a lot of attention, since Einstein and Nathan Rosen then rediscovered it in 1935 and then John Wheeler did in 1957 (and he's the one who coined the "wormhole" name at that time). I guess physicists tended to dismiss it because the math showed it would be unstable. Fiction occasionally referenced black holes functioning as passages to other spaces and times, or referred to space warps and folds of various kinds that worked analogously to wormholes, but did surprisingly little with the specific concept of an Einstein-Rosen-style wormhole. So TMP's use of the term was pretty unusual. It was Carl Sagan's novel Contact in 1985 that turned wormholes into a big thing in theoretical physics and science fiction, because he asked physicist Kip Thorne to come up with a credible FTL drive for the novel, and Thorne figured out that wormholes could be made stable with some kind of "exotic matter" with properties like negative energy. (Which, okay, sounds a lot like "protomatter," but Thorne came up with the physics first and then put a name on it, so it's not just empty words.) Other prose SF started picking up on the concept very soon thereafter, and real theoretical physicists embraced Thorne's ideas and developed them further, finding new solutions for wormhole equations and other applications of exotic matter (like Miguel Alcubierre's "warp drive" metric devised in 1994).. The "hyperspatial tubes" in E.E. Smith's Lensman series were vaguely similar to wormholes and might possibly - repeat possibly - have been suggested by Einstein-Rosen bridges. 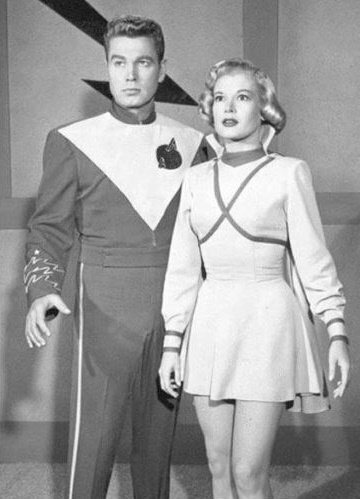 They first appeared in Gray Lensman (1939). What do you mean TNG was the first to mention wormholes by name in 1989? In your previous paragraph you mentioned the mention of wormholes in TMP in 1979. KIRK: Warp drive, Mister Scott. Ahead, warp one, Mister Sulu. SULU: Accelerating to warp one, sir. Warp point seven, ...point eight, ...warp one, sir. KIRK: Mister Decker... Wormhole! ...Get us back on impulse power! Full reverse! SULU: Negative helm control, Captain! Going reverse on impulse power! UHURA: Subspace frequencies are jammed, sir. Wormhole effect! DECKER: Negative control from inertial lag will continue twenty-two point five seconds before forward velocity slows to sub-light speed. ILIA: Unidentified small object has been pulled into the wormhole with us, Captain! Directly ahead! KIRK: Forcefields up, full! 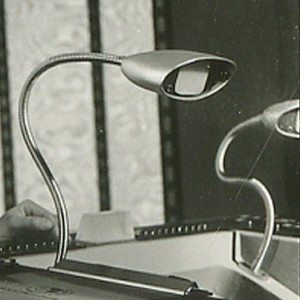 Put object on viewer. ...Manual override on helm. ILIA: Navigational deflectors coming up. DECKER: Wormhole distortion has over-loaded main power systems! ILIA: Navigational deflectors inoperative, Captain. Directional control also inoperative. KIRK: Mister Scott, we need warp drive as soon as possible. SCOTT: Captain, it was the engine imbalance that created the wormhole in the first place. ...It'll happen again if we don't correct it. What do you mean TNG was the first to mention wormholes by name in 1989. In your previous paragraph you mentioned the mention of wormholes in TMP in 1979. Sorry, I meant the first post-TMP screen production to do so. For it's time, it was a very intelligent, well constructed piece of cinematic sci fi, although if memory serves me right, it was itself based on Shakespeares' "The Tempest"
The whole Krell story was "cerebral" years before "Star Trek" was accused of being the same. Dr Morbius must have been an inspiration for Flint in later Trek, in fact, why weren't "Star Trek" producers sued for some of the similarities ? If TMP is so smart, why didn't V'Ger think to wipe the muck off it's nameplate? Why does it think "carbon units" are an infestation when there are pictures of them on the original probe? Maybe they had scientific advisors, but what they really needed was a common sense one. One of them, surely, but hardly the exclusive one. Because that's not how fiction works. Paying homage or drawing on an inspiration is not theft; on the contrary, it's a fundamental part of creativity. (You acknowledged that Forbidden Planet was itself a Tempest homage, so you should already know that.) It's only plagiarism if you take something directly from another work, if you quote verbatim dialogue or use trademarked characters or exactly replicate the plot beat for beat. If the Enterprise had actually gone to Altair IV and met Dr. Morbius and Altaira, that would've been plagiarism. Encountering vaguely similar characters is nothing of the sort. Basically, the difference is one of whether you do your own work. If you use an existing idea as your starting point and do the work to reshape it into something meaningfully different, then the result is the fruit of your own labors even if its roots in the other work are still clear. But if you directly copy and paste someone else's work and claim that you deserve credit and payment for it as your own, then that is fraud. I wasn't really suggesting plaigerism, but there were clearly parts of Forbidden that inspired, lets say, Trek. Yes, you explicitly were.You asked "Why weren't 'Star Trek' producers sued for some of the similarities?" If the similarities are close enough to be sued for, that is literally the definition of plagiarism. It is also different enough not be regarded as a direct or close copy. I wonder what 1950s audiences thought of the short skirt uniform. Though overall it's more like a circus acrobat outfit or marching band uniform than what would come to be thought of as a "miniskirt." Looks about the same length as Anne Francis’s skirts in FP. Takes place on Earth. Tell me you haven't seen this a million times: "A traveler in a saucer-shaped space craft goes down to an alien planet to extend an olive branch but is met with hostility. He escapes the custody of the aliens and disguises himself as one of them in an effort to learn more about them and eventually make it back to his ship." In the conclusion of the film, Klaatu mentions a type of interplanetary community, and when Earth is ready they could join it. This sounds a little like the United Federation of Planets and the prime directive. This movie also takes place on earth. However, besides the "Monster of the Day" plot, what is similar between this film and Trek is the organic chemistry between the characters. All of the characters in this film, both male and female, military and civilian, treat each other like equals. There is no "a woman's place is behind a stove"-style dialogue. Everyone's opinion is valued and all the characters (save for a few scientists) are treated as intelligent. Also, if you listen to the power generator start up, it's the phaser/torpedo firing sound. This film takes place mostly on earth. Not much that is Trek-like. However, the space ark has a tabletop-style control panel with a middle viewscreen that is attached to forward, side, and rear mounted cameras. And hey, John Hoyt! Rod Serling's original Twilight Zone clearly affected Star Trek a few years later; some of its writers also wrote for Star Trek. And Star Trek has had some eerie, TZ-like surprises over the years & series. Shatner himself appeared in one of the TZ's most famous eps. A number of ST guest actors had appeared in the TZ, actually. So there were some connections between TZ and ST at the time. You could say much the same about The Outer Limits. 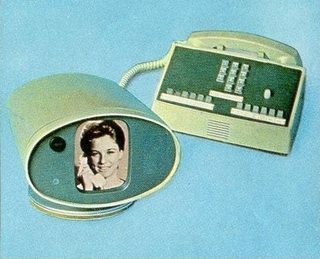 After all, those were the three big "smart" science fiction shows in '60s US TV. I believe it. But I've only seen a few episodes of The Outer Limits, I've always been far more familiar with the Twilight Zone over the decades. The Outer Limits was certainly an influence on NBC's scheduling of Star Trek episodes, if nothing else. 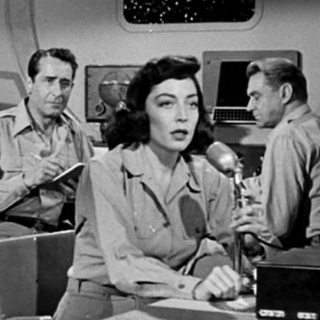 Their decision to premiere the show with "The Man Trap" -- let's face it, not one of the best or most representative episodes -- was probably based on the fact that it was a monster story, and The Outer Limits's focus on monster-of-the-week stories probably helped shape the perception that that was what science fiction was supposed to be. Although it goes back further than that, really, since TOL's monster focus was a matter of network fiat rather than the producers' choice. It was probably the wave of monster movies in the '50s and '60s that created the perception that sci-fi needed monsters to draw an audience. Of course, "The Man Trap" was the sole Trek contribution of George Clayton Johnson, who wrote several Twilight Zone episodes and had a couple of his short stories adapted to TZ by Rod Serling. I certainly loved "The Man Trap." It was certainly one of the creepier, more TZ-flavored Star Trek episodes I mean. And in its climax scene, lol, I've always joked that the salt vampire was Michelle Obama in its true form. Sorry, but their glaring snouts look so similar.